Okcash Discussion / Re: How you can help in supporting OKCash ! When you play games , use OKCash as a clantag or make a OKCash emblem if it is possible. On this note, I've been speaking with a fellow Discord Staffer and started a OKCash group for Battle.Net gamers (any game!) I personally play HotS and D3 and some Hearthstone. Here's the invite link to battle net's new social group update for the OKC Group! Any news on the CSGO Tournament? Locking the thread now so our next giveaway can stay up top! Ill take 70M and go ahead and be all 7 replies heh.. I mean no disrespect, but come on... who are you trying to fool here ? that's far away from your 2 million dollar plan. I am sure there are more than enough willing to even volunteer; or accept tips, to create a decent front end. Would be cool for an Admin of the forums to post an announcement looking for one. Or some sort of contest even..
Lpxcc, great to have you on board! The staking percentage is now at 10 % annualy. So if you buy now at this moment 1000 OK.
Than you stake with an average staking rate of 0,027% per day, so you earn 0,27 OK average every day! And you accumulate 32,4 OK in this time period. If you now look at the charts, it doesn't look much. But if you are a long-term investor, it CAN be serious rewarding. How much OK you need? 1. How much do you want to spend on cryptocurrencies? 2. How much trust you have in cryptocurrencies? 3. How much are you willing to loose? If you have answered these questions for yourself, you know how much OK you need. Perfect ELI5 explanation! This should be stickied or on a page somewhere; with some more ELI5 info hehe..
That depends on your context of team. There are many of us volunteers; although only a select few actual 'employees' of OKCash. Take a look at the Development & Tech Discussion forum, look at the users who post the threads (Like Toshi for example) to see who are a bit higher on the hierarchy than the volunteers. As for a full list; I am not sure if one is available? But I don't know anything but mspaint Maybe I'll make an MSPaint one! I'm wondering what kind of development is still happening for OKCash. I'm not really seeing any clear items on the topic. - What is the current status with large investors? Are there any additional prospects and what leads are being followed? - What commercial activity is going to be pursued in the coming month? How is the OKCash brand and usage being promoted further? - What technical advancements are currently scheduled and what is the next release date? - Is there any news regarding poloniex? 2.) We are currently discussing that, and I am personally working on spreading it via around 8 different crypto forums. But we also need the help of our OK Family to help spread the word! Money will be spent on advertising soon. Daily Steem posts, forum posts, and heightened Discord activity. 3.) Can't reveal any of that. That may be why the announcements/news/features have not been pumping out - Some of our developers were busy at the moment although right now that has changed; our value was still growing regardless. Same idea iam looking for objectif and promotion for OkCash have you some information? 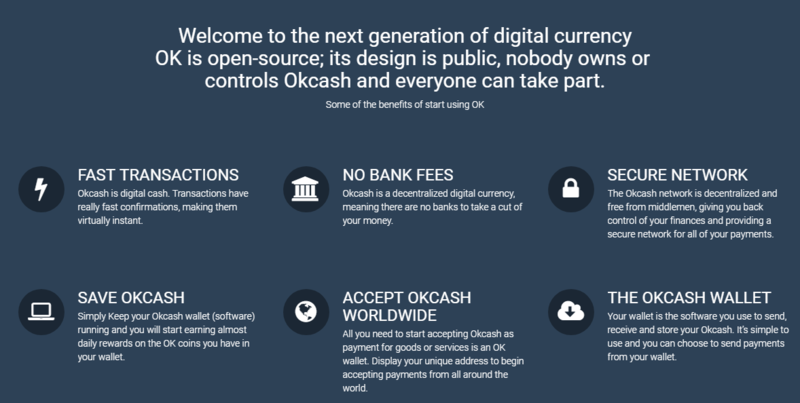 Okcash is an experimental new currency that is in active development. Each improvement makes Okcash more appealing but also reveals new challenges as Okcash adoption grows. During these growing pains you might encounter increased fees, slower confirmations, or even more severe issues. Be prepared for problems and consult a technical expert before making any major investments, but keep in mind that nobody can predict Okcash's future. GET INVOLVED! Join and participate in our Discord! And Reddit! Video on "What is OKCash"
There are a few reasons that OKCash activity has slowed down, and if you haven't noticed -- it is actually starting to gain momentum again. Anytime Bitcoin jumps up; OKCash is one of only 2 other Coins that also increases contemporaneous. Which actually has it's benefits, as the growth of Bitcoin is much more stabilized and gradual (albeit expeditious in value) than just about every other altcoin, you can roughly know where OKCash is going to be in the future if you know where Bitcoin is going to be. Don't get me wrong, OKCash will drop and gain unexpectedly just like any other Altcoin, but a lot of times there is no way to research and prepare for this; mathematical, historical or otherwise. Even Bitcoin does it; although much more sparingly than Altcoins. A Roadmap may be created in the future; but I can only speculate. I am also wondering the same. I also like okcash, but I see little activity regarding economical goals and usage promotion. As I said before, a lot of large groups still use OKCash simply because it is tried-and-true. As far as usage promotion, that is something that we are beginning to ramp up with two new releases that will be out in the coming month or two.